I’m standing at the base of Peak 8 at Breckenridge Ski Resort on an early summer morning, staring up at enticing arrows pointing three different directions. GoldRunner Coaster this way. Snow Mountain that way. Straight ahead for the Alpine Slide. Today’s challenge is real: How do I pack a big-hitter Peak 8 summer adventure menu into a half-day? Turns out, it’s simple. Here’s my play by play. Feel free to borrow this plan of attack to get the most out of your day on Peak 8. I pack a small backpack—perfect to stash at the bottom of rides and activities—with water, my phone, sunscreen and Chapstick and an extra layer in case afternoon rain rolls in. Tips: Slather on the day’s first layer of sunscreen at home to shorten prep time on the mountain. Wear comfortable active wear, sneakers and sunglasses and drink lots of water with a hearty breakfast before heading out. I arrive at the Activities Center at Base Camp to fill out a waiver and get my Adventure Pass wristband. A few families are filtering in, toddlers to teens buzzing about which activity to run to first, parents deciphering which pass is best. There’s great energy up here and the enthusiasm is contagious. Tip: If you know which activities or which pass you’d like, you can purchase ahead of time and fill out your waiver online to save a few minutes. I have my wristband! Ride lines are forming, so I decide to hit the Base Camp activities first and then head up to Alpine Camp. The short GoldRunner Coaster line moves swift. I’m giggling inside, watching nervous adults waiting for their coaster cart to pull up while the kids look ecstatic. When it’s my turn, I’m squealing and perma-grinning through the trees and around the metal track like an eight-year-old. It’s tempting to hop back in and lap the coaster all day. There’s no line now. But, on to the next! 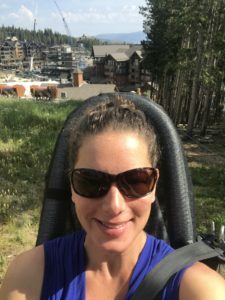 I’m digging this chairlift ride up to the top of the Alpine Slide—the views are amazing on the steady uphill chug overlooking slopes and kids whipping down the slide below me while a mom laughs from the next track at her sons’ heckling. The slide is the obvious fan favorite. Gravity grips my yellow sled and I’m twisting down the Alpine Slide. Trying to resist my urge to brake, I pull the slow-down lever back on sharp corners and rocket down the half-mile track. 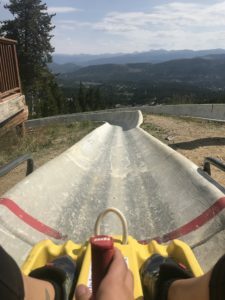 Tip: Head straight to the Alpine Slide in the morning. Then hit the coaster. Or, if you’re adding on the zip line, beeline it there. The slide and zip line are the most popular attractions. It’s time to head up to Alpine Camp at the top of Peak 8. 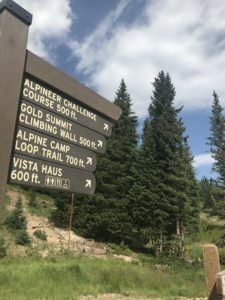 I walk right up and hop on the high-speed six-person Colorado SuperChair, watching mountain bikers zigzag down the slopes, a chipmunk nibbling breakfast, the Continental Divide stretching out, dipping and rising for miles. It’s pin-drop quiet and peaceful. No music, no chatter, thick forest, blue sky and a calm 72-degree breeze. I close my eyes and enjoy a true moment of mountain zen. Tip: This is an optimal time to snap some selfies with the resort sprawled out below and Keystone in the distance. There’s so much to see up here. I follow signs to the Vista Point Overlook and climb the stairs where I’m perched like a hawk with bottomless mountain views. Soaring Peaks 7 and 8 make me feel small and grateful—we all need that reminder every now and then. 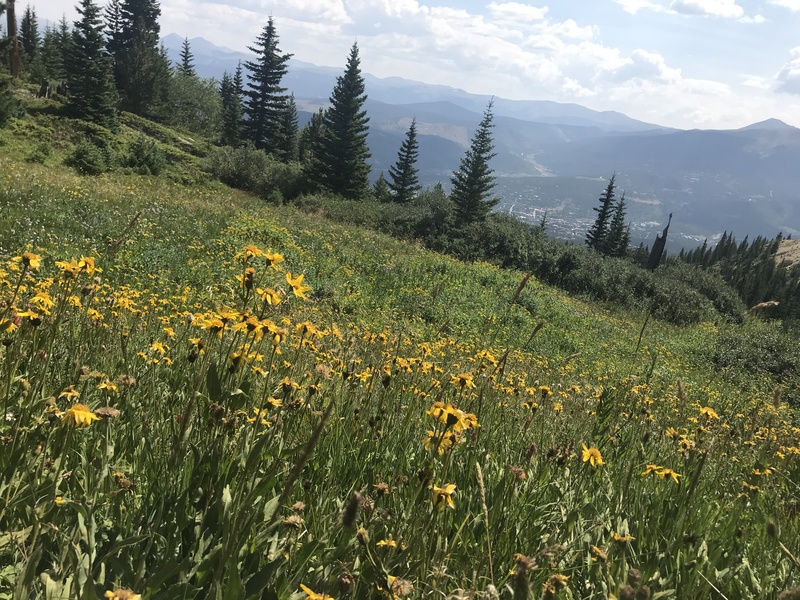 Tip: This is for everyone—the chairlift ride, the walk around Alpine Camp and the spectacular lookouts. Get the grandparents up here for the incredible 11,000-foot Colorado experience. They’ll thank you. Wildflowers are blanketing hillsides like a painting, so I decide to hike the 1.5-mile Horseshoe Loop. Reading the smartly placed story stakes, I’m digesting nuggets of Breckenridge gold mining history and learning about the pika’s ability to collect enough food to fill a bathtub in preparation for winter. Smart ‘lil boogers. Slipping into a harness at the Alpineer Challenge Course, I’m admittedly intimidated by the 15 high alpine features playing out above me. Heights and balance aren’t my jam. Once I get the hang of the magnetic clip and harness system, I’m shimmying across swaying logs and tilted planks, even walking a tightrope. 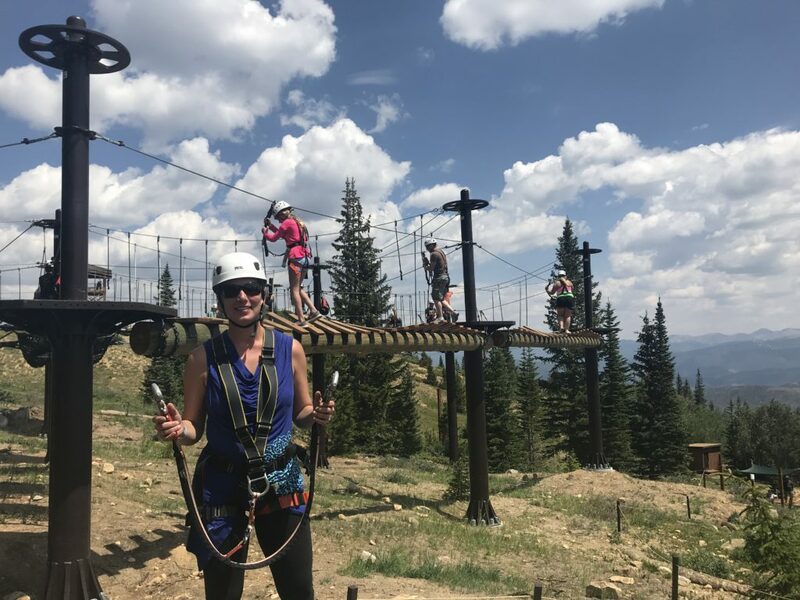 Sure, I went the more “mellow” route and needed a few pep talks from the instructors (“don’t overthink it,” “you’ve got this” — thanks, guys), but I left that final platform with a legit sense of ninja course pride. Tip: Wear sneakers—shoes must be secured with no open-toes. I’m feeling strong and decide to tackle the Gold Summit Climbing Wall. I take the intermediate route up the 40-foot craggy monster and wonder if I have time to squeeze in a round of mini golf back at the base. Heading down to Base Camp, the Colorado SuperChair drops me on the doorstep of one of my favorite spots in Breckenridge—The T Bar for a celebratory beer and some spicy wings. I score a sunny patio seat and toast my morning playground. 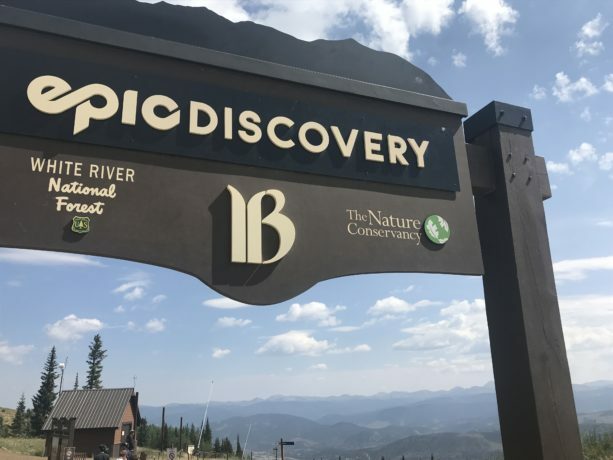 Visit the Epic Discovery page to plan your half- or full-day Peak 8 adventure.